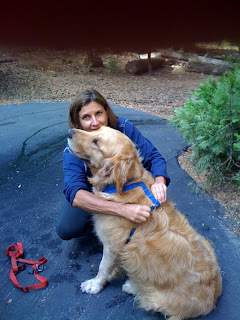 As a responsible pet owner, I believe it is important to talk about pet safety while traveling. OK, we all know how important it is to wear a seat belt while driving. It is actually the law. It has become an automatic response when we jump into our car to automatically click our self in our seat. Well, what about our pets? They are precious cargo. How come so many people zoom down the roads with their dogs clutching to their seats without restraint. I have seen so many dogs holding on by their paws in the back of trucks without restraints as they squeal around corners. It is so hard to see. What if you have to slam on your brakes. Where is that dog going to go?! Whenever we travel with our pets, we place a harness on them. It's like a four point restraint. You can buy them at any pet store such as Petco, Petsmart, Pet Club. Murphy loves it when I place his harness on because he knows "I am going for a ride". He sits patiently while I place it on his back. Once he jumps in the car, its just a matter of clicking him in. As I drive down the road, I am rest assured that we are all taking pet safety into account. 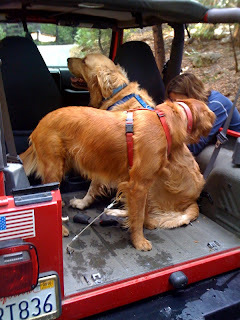 I have included a couple photos to show you how simple it is to secure your pet in your car. The dogs love the fact that they can stick their nose into the fresh air as we sail down the road. I love the fact that they can safely enjoy the ride without worrying that they could accidentally fall out. The only thing they have to worry about is my driving "Just Kidding"! Take a few extra minutes to ensure your pets will be safe before you take your next outing. Remember - they are precious cargo. You can find our detailed trips at http://www.BarleysList.org/adventures.php or from the home page select Click Here For Our August Adventure". See you there!